If you’re a recent college grad, finding a creative job that pays the rent can be about as difficult as graduating without student loan debt (so, nearly impossible). For most, just being able to identify your dream job is a huge accomplishment. But what do you do if that dream job doesn’t seem to exist? Answer: keep looking. 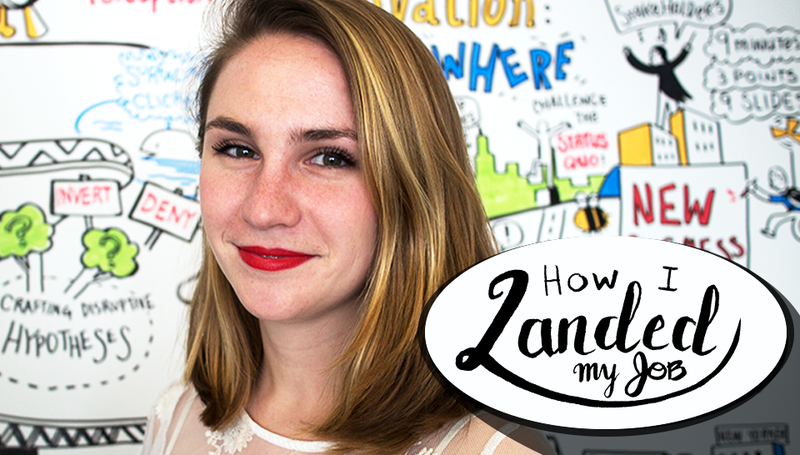 Welcome to How I Landed My Job, a series of stories about graduates who took an unconventional approach to landing a job they love. As part of Fifth Third Bank’s Brand of You campaign, $1 million in one-on-one career coaching scholarships is being given away to recent graduates. Head here to learn how you can enter for the chance to win job search training, worth $1,000. Her career goals became clearer but slightly more complicated during her internship at an architecture firm, where she had to focus on developing her digital media skills. “As somebody who loves to draw, it was hard for me to make the switch,” she says. The experience solidified how much she wanted to find a career that valued hand-drawn work above all. Only problem? Hand-drawing opportunities were almost nonexistent outside of freelance work. Greta loved the hand-drawing opportunities of an architecture degree, but found the industry’s focus on digital media unfulfilling. Recognizing this, Greta decided to cast a broader creative net, and begrudgingly applied to an array of digital design jobs. Not only did these positions inspire minimal enthusiasm, she was also competing against graduates who had focused on graphic design for four years while she’d been studying architecture. Her passion for drawing wasn’t going to cut it. Greta became vigilant. She invested a considerable amount of time and energy in amping up the search aspect of her job search. She checked the arts-oriented job listings on the New York Foundation for the Arts website daily. One day, a headline leaped out at her: “Do you love to draw by hand?” Umm, yeah. The listing was for a Graphic Recorder position at ImageThink, a company that creates visual representations of meetings, keynotes, brainstorms, and the like. The perfect job did exist! Now she had to make her case. “I responded within minutes with my resume and portfolio,” Greta remembers. “I wanted to tell a story about why I was an ideal candidate, not just any candidate,” she says. “[I] showed this through the link between visual storytelling, architecture, and art — how my background would make me a great Graphic Recorder.” Her portfolio was her chance to present visual support for her argument. She included the best hand-drawn work from her own creative endeavors along with some editorial illustration work, a few digital graphic design projects, and architecture assignments that displayed her skills. She landed an interview. To showcase her draftsmanship skills, Greta brought her sketchbook from a recent trip to Europe on a drawing grant. Her work really wowed her interviewers. As the interview approached, Greta alternated between nervousness and excitement. “I had absolutely no idea what to expect, but I remember hoping that I would have to draw something live.” While she’d already submitted her portfolio, Greta decided to bring further proof of her hand-drawing talent: the sketchbook from her summer in Europe on a drawing grant. Jackpot. Greta’s pre-interview prep paid off. When she met with the founders of ImageThink, they were impressed with the two comparative drawings she’d brought. Bonus? “The sketchbook was a total hit!” Then her interview prayers were answered. She was given a test she’d already done multiple times: illustrating a TED Talk. Only now, she had to do it live and large-scale, on a huge whiteboard. “I was nervous,” she says. “Graphic recording was a completely new concept and way of drawing and thinking.” Greta was up to the unique challenge, which happened to involve drawing a miniature version of the Mona Lisa. As a Graphic Recorder, Greta creates dynamic visual representations of presentations, meetings, and lectures. Greta got the job. She now spends her days drawing clients’ keynotes, debates, and brainstorms in real time. Her work becomes a beautiful record of an event — it establishes ideas, captures arguments, and organizes topics. Recently, she stood onstage with the nearly seventy speakers at this year’s South by Southwest and drew their presentations. “Every job is different,” she says. “It’s a performance, all while doing something I love.” Not a bad way to pay the rent. Greta is a prime example of a graduate who adapted after realizing that her major wasn’t a direct path to her dream job. Her success is a testament to developing one’s own passions, whether in or out of the classroom. What you consider a hobby could be the thing that catches an employer’s attention. You’ve heard Greta’s story — now it’s time to share yours. How have your personal passions influenced your professional life? Did your major prepare you for the job you have, or did you have to look outside your education? What’s the craziest thing you ever did to get an interview, make an impression, or land a job? Share your career stories in the comments! As stories like Greta’s prove, a college degree doesn’t guarantee a full time job offer. Most graduates don’t know how to develop and promote their strongest asset: their personal brand. That’s why Fifth Third Bank teamed up with NextJob to create the Brand of You campaign. As part of this initiative, Fifth Third Bank is giving away $1 million in personalized job search coaching to help recent graduates navigate the job market as they deal with paying student loans. All it takes to enter is a simple Tweet. Visit 53.com/BrandofYou to learn more about how you can win a job search training package worth $1,000, or tell us why you deserve a scholarship by posting a Tweet with #brandofyou and #53enter for a chance to win. Fifth Third Bank. Member FDIC. This post is a sponsored collaboration between Fifth Third Bank and Studio@Gawker.